Called “A Millennial Motivator” by Fortune and “The Brené Brown of Wonder” by Mind Body Green, Amber Rae is an author, artist, and speaker that encourages creativity, personal growth, and emotional well-being. Her writing and speaking blends raw and relatable stories with actionable aha! moments, and has reached over 10MM people in 195 countries. Called “calming and electrifying” and “an approachable beacon of light,” she’s motivated audience at companies like Kate Spade, Lululemon, The UN, WPP, Entrepreneur, Parsons College of Design and charity: water to create beyond fear, and she’s advised leaders at companies like Adobe, IDEO, Google, Facebook, and Apple. She’s also a career advice columnist at SELF magazine, where she offers advice with radical empathy and care, real talk and real experience. Her work has been featured in outlets like The New York Times, NY Mag, ABC World News, Forbes, TIME, Fast Company, Fortune, Inc., BBC, Mind Body Green, and Tim Ferriss’s blog. She lives in Brooklyn, New York (and around the world) with her fiancé, Farhad. 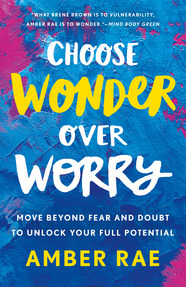 Choose Wonder Over Worry: Move Beyond Fear and Doubt Wonder is what we’re born with. Worry is what we learn. Based on her bestselling book by the same name, Amber Rae combines relatable storytelling with actionable aha moments to inspire audiences to face their fears and rewrite the stories that hold them back. If you’ve ever worried you’re not good enough, or feared you’re a fraud, or self-sabotaged in the face of success, you’re not alone. This encouraging talk will equip audiences with the courage, curiosity, and compassion to face any challenge that comes their way. Want To Realize Your Potential? Overcome These 5 Worry Myths Thousands have realized the key to unlocking their true potential - and now it’s your turn. In a talk called “the most valuable hour I’ve spent all year,” Amber Rae will illuminate the lies we tell ourselves and how to create lasting change in all areas of our life. Drawing from culture, science, and her own hilarious mistakes, this talk is filled with aha moments and relatable moments that will leave audiences inspired to accept where they are as they act on what matters most. Empowering Women In Business: Be Brave, Be Bold, Be You From working with the most iconic brands as a marketer to rising the ranks in Silicon Valley to starting her own brand and becoming a bestselling author and international speaker, Amber Rae knows what it takes to be heard, be seen, and be unapologetically herself. In a time when women’s voices are needed more than ever, Amber will share the five ways to rise as a woman leader, giving the encouragement and gusto for women to carve their bravest path yet. From Ambitious to Alive: Become the Leader You Most Want to Be In a changing world of work, the old rules are leaving us burnt out, unfulfilled, and disengaged. How do we find meaning at work? How do we step into roles where we thrive and feel our voice heard? How do we move from simply getting ahead to also coming alive? In this talk, Amber will share the five principles for coming alive with actionable strategies to begin the journey today. Audiences will leave this talk with the inspiration, steps, and perspective to become the leader they most want to be. Trial, Error, and Creative Breakthrough Amber’s path to becoming an artist and creative was entirely unexpected. Through trial and error, following threads of curiosity, tuning out distractions and noise, and sharing her story and struggles, Amber learned to unlock her creativity and share her gifts. In this talk, Amber will share the questions she asked, the trials and tribulations she stumbled through, and the breakthroughs she experienced to inspire audiences to begin their own path to greater creativity and innovation. Amber Rae – 2018 Speaking Reel from Amber Rae on Vimeo. CBS featured Amber Rae’s book Choose Wonder over Worry. Amber was named Entrepreneur and Writer in Forbes. Minimalist Matt D’Avella talks with Amber about the myth of success. Bustle named Amber Rae’s book the one advice book you should read. "Amber doesn’t just bring wisdom and insight to the stage—she brings meaning. My audience was moved by her talk, and many told me afterward that it helped them reflect on what matters most and how to achieve it." "Amber Rae offers inspiring insights and lessons for anyone wanting to unfold their infinite potential." "Amber Rae was the only speaker who got a standing ovation from the audience."